Time for a book review, since I haven’t done one in awhile, and I have a fabulous new book to tell you about! Age: Technically listed under Adult but teens would love it too! My thanks to Bethany House for the complimentary copy of MARK OF THE RAVEN. I was not required to write a positive review. These opinions are entirely my own. Aaah, that was so cool! Now where’s the next book? I love a good epic fantasy and this one was awesome! The world was so rich and the characters were fantastic. The plot was a slow-burn kind of one, full of mystery and politics but enough spice of danger and adventure to keep you on the edge of your seat—the rest of it did that actually as well! I love anything involving dreams in fiction so I was really excited to try this one. Like Inception in a fantasy world. 😛 The Dreamwalking was a cool aspect to the book. I particularly liked the soul aspect of it. I think I thought there would be more time spent in the actual dreamscapes, but at the same time I don’t really mind because the rest of the book was so cool too! I was so intrigued by this setting and loved the world-building. The idea of the seven nations and the Great Houses and their secrets and gifts was so intriguing. The political intrigue aspect of it was interesting instead of boring. It made me think a little of Jill Williamson’s fantasy, which is high praise from me. 😉 I was pulled into this story and loved visiting these mountains, castles, secret passages, and seaside—and the different Houses were really neat. Everything had a distinct feeling and vibrant color to it and I thoroughly enjoyed reading it. I can’t wait to return to this world and find out what happens next, as well as learn more about the gifts—and spend more time with these characters. The atmosphere of the book was just really neat—with the rich colors, the harsh beauty of the mountains, the shadows and mysteries of Rook Castle, the autumnal feel, the meetings and gala and dances, the passages and secrets, and all shot through with so many questions and interesting thoughts, a thread of faith in a unique way, and the many varied people and cultures inhabiting this world. It took me a little while to get invested in the story (maybe until meeting Damien?) but once I got into it, I lived and breathed it, and now I’m sad it’s over. There were some pretty neat twists at the end which make me super curious to read the next book! I NEED IT. Lady Selene is the heir to the Great House of Ravenwood and the secret family gift of dreamwalking. As a dreamwalker, she can enter a person’s dreams and manipulate their greatest fears or desires. For the last hundred years, the Ravenwood women have used their gift of dreaming for hire to gather information or to assassinate. As she discovers her family’s dark secret, Selene is torn between upholding her family’s legacy — a legacy that supports her people — or seeking the true reason behind her family’s gift. The Last Motley Blog Tour! Welcome to the virtual book tour for The Last Motley by Grace Award nominated author DJ Edwardson. I’m SO excited to be a part of this! 😀 I absolutely loved the book, and you can read my review for it HERE! To celebrate the book’s release, the digital version is being offered at the special discounted price of 99 cents, now through February 17th. In addition, you’re invited to come along on a virtual treasure hunt visiting some of the places featured in the novel. And to help you along your journey, we’re giving away a few prizes, too. So how ’bout them apples? The ancient edifice of Castle Brimstoke looms lonely and defiant on the end of a long, narrow promontory rising high above the Neverless Sea. The charcoal gray fortress is dominated by a frenzied assortment of serrated spires, like an arsenal of jagged swords thrust into the cliff. The crumbling stonework appears as if it had been chiseled out of the rocks long ago and then forgotten and left to decay. The narrow land bridge granting access to the castle is close to a quarter mile long. Mortared stone walls line the approach, but like the castle itself, they too are in disrepair. As long as any can remember this bulwark has been the residence of the fiery and independent Brimstoke line, nobles whose peasants have worked both the land and sea. 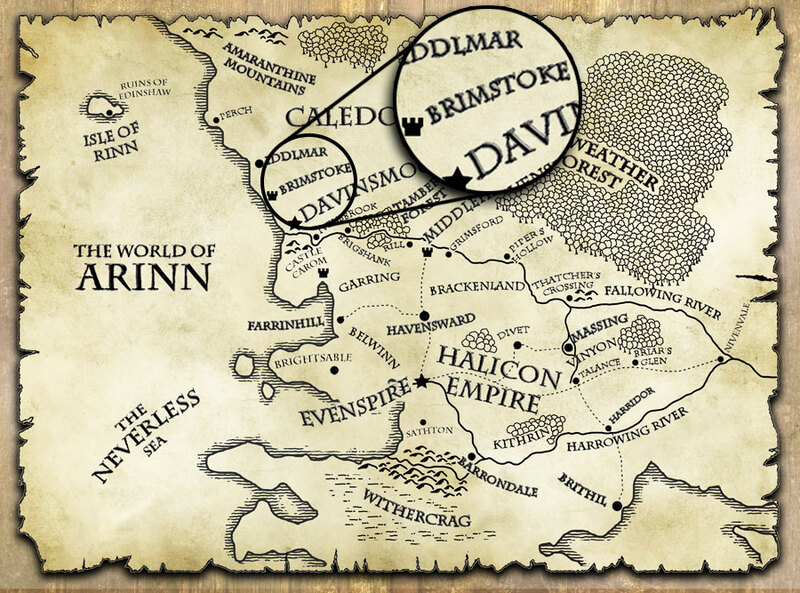 Rumors paint the barons of Brimstoke as cruel and harsh taskmasters, but sequestered as they are in remote northern lands, who can say whether the rumors are true or whether the Brimstoke line died out long ago. We hope you enjoyed this little glimpse into the world of Arinn. If this taste has you curious, be sure to check out the full length novel set in this world. This unique tale is not your typical fantasy novel. Yes, you’ll find monsters, dungeons, harrowing escapes, magic portals, humor, an ancient artifact, and much more, but above all: This is a story about the importance of family, faith, and the courage to do the right thing. Motleys. Candy-colored creatures with dark powers to drain the souls of men. That’s what Roderick always thought. Until he met one. Now he’s not so sure. But with seemingly everyone in the province hunting the motley down, he must quickly decide which side he’s on. Is the motley the living nightmare the legends say? Or just a child cursed by magic? Should Roderick save him from an awful fate, or turn him in? Either way, it seems like everyone wants to make sure that this will indeed be the last motley. And you can add it to your to-read list on Goodreads. As you follow along on this virtual tour of Arinn, be sure to enter the giveaway to make your journey a little easier. Maybe you’ll be one of the ones to find treasure at journey’s end. You can use the journal to record your travels, the novel as your guide, and the coloring book to, well…for those rainy days when you’re stuck in the inn! PLEASE NOTE: By entering the giveaway you agree to receive occasional email updates about DJ Edwardson’s releases, sales and book reviews. He will not share your email for any reason and you can unsubscribe at any time. Entries accepted until February 23rd. Now if you’re feeling especially adventurous, there is a separate giveaway for the truly dedicated treasure hunters among you. All you have to do is collect ALL TWELVE location names on the tour (e.g. if this were for Middle-earth the answers might be Rivendell, The Shire, Mordor, Gondor, etc. — basically we’re looking for the names of the places featured on each of the maps at every stop). 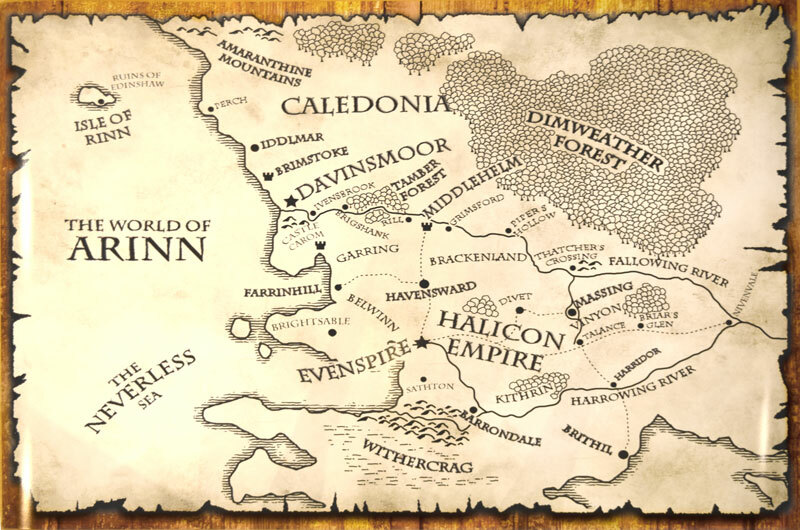 and you will be entered in a drawing to win this one-of-a-kind poster of the World of Arinn. Measuring 36″X24″ it is nearly movie poster size, printed on thick, glossy paper, and suitable for framing. In addition, the map will be signed by the author. This is a prize you won’t find anywhere else! (actual photo) It’s even more impressive in person. It’s huge! You will not be added to the email list for this drawing. Entries accepted until February 23rd as well. Winners for both contests will be contacted within three days of the closing of the contests. There are many stops along this virtual tour. Be sure to check them all out. Thanks for joining us on this journey! Well? What do you think? Are you intrigued by the book? Because it’s WONDERFUL! 😀 I loved it so much! ^_^ Be sure to check out the giveaways and enter, and I hope you enjoy the tour stops! 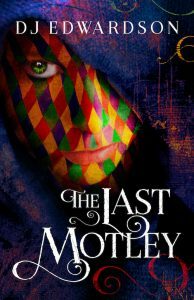 If you love epic fantasy with a thread of faith and family and humor and goodheartedness, you’ll love The Last Motley. 😉 Thanks for reading! I fell in love with Jill Williamson’s Blood of Kings trilogy, so it was with great delight that I learned of this prequel-series of sorts, The Kinsman Chronicles, of which KING’S FOLLY is the first installment. I’m so excited for another fantasy work from this author! I’ve enjoyed her other books — frankly, her writing would shine on a cereal box — but (personally) I think her real genius lies in this genre, and you can see it in every page of this latest novel. The writing is incredible. It made for that wonderful moment where you just go “wow, that is GOOD writing” and proceed to lose yourself in its quality. The world is fantastically well-drawn, the cultures and languages and settings and peoples and legends… Politics and complex situations and character relationships are all crafted brilliantly, with the multiple storylines seamlessly weaving together into a massive epic of a fantasy tale. It’s off to a great start which I can’t wait to continue with the next book! There are SO many characters in this thing, and it was fun to sort them all out and follow their stories. I’ll admit that I gave up on keeping track of all the side-character names fairly early on, which wasn’t usually a problem since I could at least keep the main people straight. (The character list of some of them, as well as the map, were much-referred-to by me as I read, and very helpful.) Though I must say that near the end, there were a few people I was rather confused about… but I think I did all right. Characters tend to make or break a novel for me lately, and these were awesome and SO well-written. I loved many of the characters, and it would take all day to talk about them all, but three stand out as my favorites. Prince Wilek and Prince Trevn — that’s a given! — and then Kalenek, Wilek’s Shield. So many awesome characters! And all so different, too. Fifteen-year-old Trevn is in some ways Wilek’s opposite, but I love him too. He’s so FUN! Energetic, mischievous, cocky, funloving, a bit of a trickster and a rebel, he’s definitely a favorite. He runs across rooftops! What is not to love. Though he has his own problems, too, and his parts of the story were definitely exciting. Kalenek surprised me as a favorite character. The scarred bodyguard (or “Shield”) of Prince Wilek, Kal has some struggles of his own and an intriguing tragic past. I was so excited to start getting his point-of-view chapters in the second part of the book, and I’m very much looking forward to learning more about him! 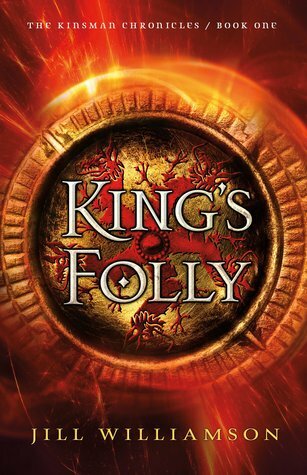 Overall, KING’S FOLLY is a well-written and fabulous, if somewhat dark, epic fantasy read with a plethora of characters you’ll fall in love with and an original world to get lost in. I enjoyed it and am looking forward to Book 2 of The Kinsman Chronicles, KING’S BLOOD. My thanks to Bethany House for the complimentary copy of KING’S FOLLY which I received in exchange for my honest review. These opinions are entirely my own. Volcanic eruptions, sinkholes, ground shakers–everything points to their unhappiness. At least that is what the king of Armania believes. His son, Prince Wilek, thinks his father’s superstitions are nonsense, though he remains the ever dutiful heir apparent to the throne. When a messenger arrives and claims that the town of Farway has been swallowed by the earth, the king sends Wilek to investigate. But what Wilek discovers is more cataclysmic than one lost city. Even as the ground shifts beneath his feet, Wilek sets out on a desperate journey to save his people and his world. But can he do it before the entire land crumbles? Jill Williamson is a chocolate-loving, daydreaming, creator of kingdoms and the award-winning author of several teen novels including By Darkness Hid (fantasy) and Captives (dystopian). She’s a Whovian, a Photoshop addict, and a recovering fashion design assistant, who grew up in Alaska without electricity. She currently lives with her husband and two children in Eastern Oregon, where there are more deer and cows than people. She blogs for teen writers at www.goteenwriters.com. You can also visit her online at www.jillwilliamson.com, where adventure comes to life.